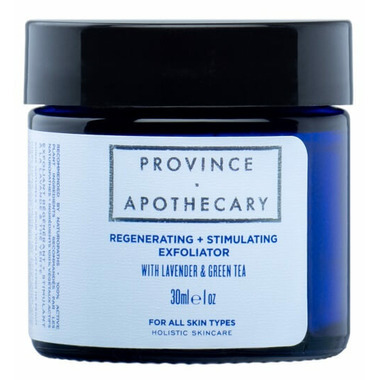 Province Apothecary Regenerating + Stimulating Exfoliator naturally exfoliates and hydrates your skin. This dry exfoliator is perfect for all skin types. It allows you to chose what works best for your skin, as the seasons change. Mix with: water for a stimulating exfoliation for all skin types. Oil or cream for dry or sensitive skin. Yogurt for oily skin (deeper aha-type exfoliation) & Honey for healing (acne) and toning the skin. Directions: Wet face with lukewarm water. In palm, mix equal parts exfoliator + liquid to make a runny paste. (1 tsp exfoliator + 1 tsp liquid). Gently rub onto a clean face and neck in small, circular motions for 1-3 minutes. Rinse off with a damp cloth. Finish with an application of Province Apothecary toner. Use 1-3 times per week. *You'll love using this product in the shower. You can leave this exfoliator on as a healing mask while you condition your hair. **Avoid letting moisture or liquid into the bottle, this will spoil the product. After reading the reviews I felt iffy about ordering this for my skin specifically but I was wrong to doubt! In the past Iâ€™ve always assumed exfoliants need to be coarse to be effective but itâ€™s not true! This lovely exfoliant left my skin glowing and removed a lot of black heads on my nose and chin with first use! Extremely happy with this product, only a small amount necessary and leaves your skin smooth and clean. This product is amazing. I have rosacea and very dry skin, and haven't been able to find a gentle exfoliator that doesn't irritate or burn my skin. This product leaves my skin super soft and glowing. I would recommend it to anyone with difficult sensitive skin. As a side note, it probably wouldn't be scrubby enough for someone with oily skin. Just ok - for me personally this exfoliator didn't do much . I won't repurchase but the price is reasonable. This is a good exfoliator. This exfoliator is not abrasive at all but does help to remove dead skin. My skin is noticeably smoother after use without feeling dry or stripped.